The Chinese year of the yang starts today. You can see its horns in the character (taken from the Epoch Times, a committedly independent source of Chinese news) – but is it a sheep or a goat? The distinction is not as clear as it would seem. 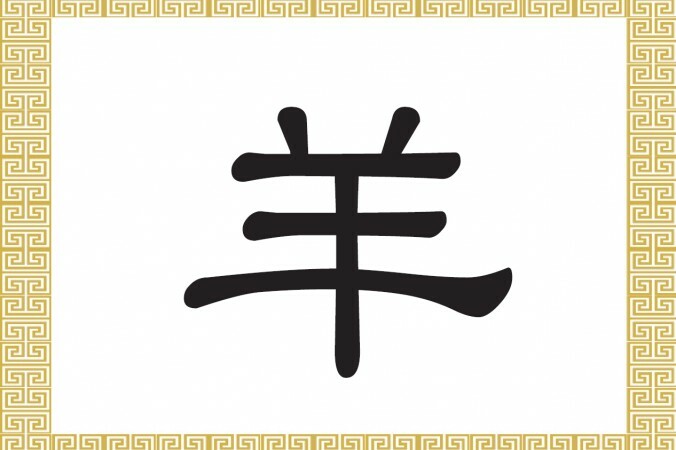 Yang signifies peace, blessing and fortune, as it is part of the character xiang, or auspiciousness, but it also signifies both sheep and goats; it’s a general word for any member of the caprinae subfamily. Other languages seek to create a division that isn’t there, perhaps because these vernaculars have been shaped by the bible story that the sheep and goats will be divided according to their respective good or bad deeds. In English, the yang lunar year is usually known as year of the sheep, but the French prefer to think of it as year of the goat. It seems that only you can define its characteristics, positive or negative, by qualifying it further. For example, a goat is a “mountain yang”, a sheep is a “soft yang” and a Mongolian gazelle is a “yellow yang”. “This ‘yang’ is fictional. It does not refer to any specific kind (of sheep or goat),” Zhao Shu of the Beijing Research Institute of Culture and History reported to Fran Wang at AFP. May this new year bring you sheep suet jade, may you soon cast off your knitted sweaters as spring approaches (or wrap snugly into them if you live in the south), and may you be safe all year from falling into the tiger’s mouth!